BCCI on Monday announced India's 15-member Squad for ICC ODI World Cup 2019 to be held in England and Wales. The list declared by Chief Selector MSK Prasad has got few surprises. Virat Kohli will remain as the Skipper. Rohit Sharma, Shikhar Dhawan, KL Rahul were selected for Top Order. Kedar Jadhav, Vijay Shankar & Hardik Pandya will solidify middle-order as all-rounders. MS Dhoni & Dinesh Karthik got into the team as wicket-keeper batsman. Karthik was preferred over Rishabh Pant over wicket-keeping skills. Kuldeep Yadav, Chahal, Ravindra Jadeja and Axar Patel are the spinners chosen. Jasprit Bumrah, Bhuvneshwar Kumar and Mohammed Shami have been picked up for pace. KL Rahul is the reserve-opener, Dinesh Karthik is the reserve wicket keeper, Jadeja and Axar Patel are the reserve-spinners. India's first game in the World Cup will be against South Africa on June 6th. The much-awaited match with Pakistan is going to be on June 16th. 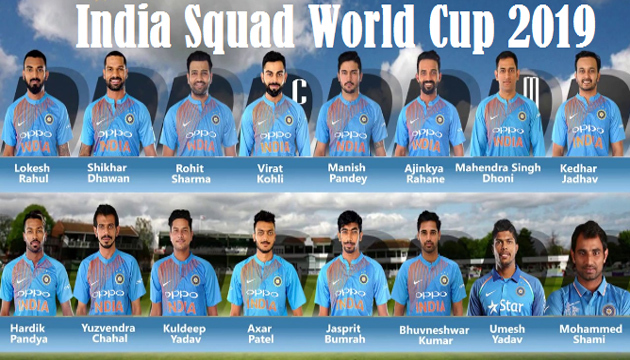 India World Cup 2019 Squad: Virat Kohli (c), Rohit Sharma, Shikhar Dhawan, KL Rahul, Vijay Shankar, MS Dhoni, Dinesh Karthik, Kedar Jadhav, Hardik Pandya, Ravindra Jadeja, Mohammed Shami, Kuldeep Yadav, Jasprit Bumrah, Yuzvendra Chahal, Bhuvneshwar Kumar. Where Is The Strong Opponent For Modi?